After months of nothing, things are suddenly moving forward with the Universal Uclick/USA Today puzzle plagiarism scandal. 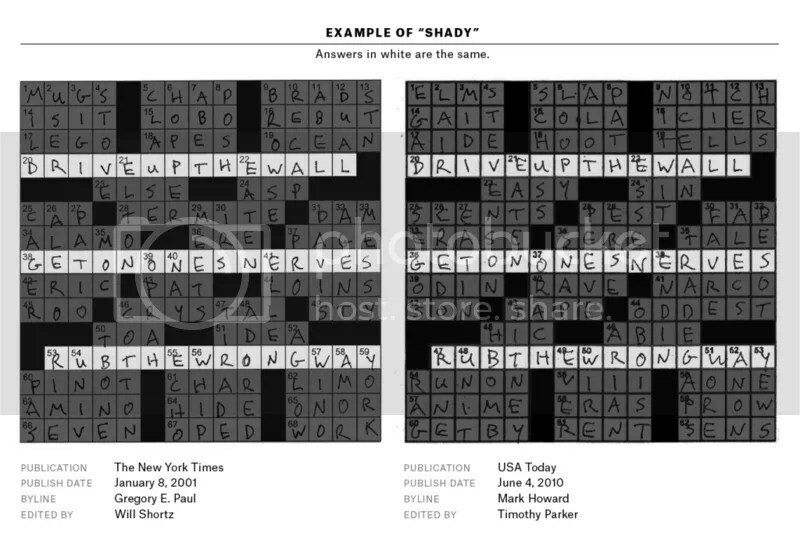 A quick recap: Programmer Saul Pwanson and constructor Ben Tausig uncovered a pattern of unlikely repeated entries in the USA Today and Universal crosswords, both of which are edited by Timothy Parker. Eventually, more than 65 puzzles were determined to feature “suspicious instances of repetition” with previously published puzzles in the New York Times and other outlets, with hundreds more showing some level of repetition. Parker “agreed to temporarily step back from any editorial role for both USA Today and Universal Crosswords” in March. Last week, there was finally a new development, as Universal Uclick stated that they’d confirmed “some” of the allegations against Parker, and he’d be taking a three-month leave of absence. That underwhelming semi-admission of Parker’s guilt led Lone Shark Games and Mike Selinker to call for a boycott of USA Today and Universal Uclick, and many other game companies and puzzle constructors have followed suit. Well, as reported by Oliver Roeder of FiveThirtyEight, Christopher Mele of the New York Times, and Deb Amlen of Wordplay, Timothy Parker is out as editor of the USA Today crossword. No puzzles that appear in Gannett/USA TODAY NETWORK publications are being edited by Timothy Parker nor will they be edited by Timothy Parker in the future. This still leaves some important details up in the air. For one thing, Parker is still employed by Universal Uclick, even if USA Today and Gannett won’t be using any puzzles he’s touched. We also don’t know who will be taking his place providing puzzles for USA Today and other Gannett publications. Fred Piscop, who has been interim editor, told me that his position was temporary unless he was officially informed otherwise, and that there was nothing else he could tell me at this point. A call to Universal Uclick was not returned. Clearly things are far from settled for Parker, Universal Uclick, and USA Today. As far as we can tell, USA Today and its parent company Gannett just vowed not to use puzzles edited by Timothy Parker ever again. That bold statement — sure, months late, but welcome nonetheless — was all we were looking for. If they stick to their word, we’ll stop our boycott. We can’t claim credit for the result, but we can say that our friends shining a flashlight on the wrongdoing did help get USA Today to speak out publicly and settle the score. We’re maintaining the boycott of Universal Uclick, though. They’re continuing to employ someone they’ve admitted is a plagiarist—someone who apparently plagiarized our friends’ work. And just because USA Today isn’t buying Parker’s puzzles doesn’t mean no one else will. We can’t even be sure if the person editing the puzzles isn’t Parker, because he’s made a habit of hiding behind pseudonyms. So we’ll keep this boycott going until we’re sure they’ve got a plan for puzzles that aren’t edited by someone they think is a plagiarist. Uclick, the ball’s in your court. This entry was posted in PuzzleNation, Puzzles and tagged Announcements, boycott, Christopher Mele, Cluing, constructing, construction, crossword, crosswords, Dan Feyer, Deb Amlen, FiveThirtyEight, Fred Piscop, Gannett, Geeking Out, gridgate, mike selinker, New York Times, New York Times Crossword, Oliver Roeder, plagiarism, Pop culture, PuzzleNation, Puzzlin' fool, Timothy Parker, Universal Uclick, USA Today, Wordplay by gmdirect. Bookmark the permalink.